434 pages | 14 Color Illus. | 131 B/W Illus. Parallel I/O is an integral component of modern high performance computing (HPC), especially in storing and processing very large datasets to facilitate scientific discovery. Revealing the state of the art in this field, High Performance Parallel I/O draws on insights from leading practitioners, researchers, software architects, developers, and scientists who shed light on the parallel I/O ecosystem. The first part of the book explains how large-scale HPC facilities scope, configure, and operate systems, with an emphasis on choices of I/O hardware, middleware, and applications. The book then traverses up the I/O software stack. The second part covers the file system layer and the third part discusses middleware (such as MPIIO and PLFS) and user-facing libraries (such as Parallel-NetCDF, HDF5, ADIOS, and GLEAN). Delving into real-world scientific applications that use the parallel I/O infrastructure, the fourth part presents case studies from particle-in-cell, stochastic, finite volume, and direct numerical simulations. The fifth part gives an overview of various profiling and benchmarking tools used by practitioners. The final part of the book addresses the implications of current trends in HPC on parallel I/O in the exascale world. "While I/O has become a major performance bottleneck in HPC, no single reference allows practitioners to understand the complex interactions between applications, libraries, and file systems. 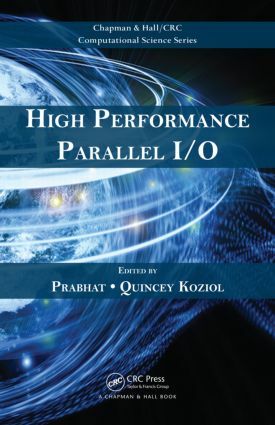 This book fills this major gap; written by the best experts in the field, it is likely to become a necessary reference to anybody who wants to understand I/O on HPC platforms." "It is…remarkable to have a broad overview of past, present, and future technologies, with a focus on real problems and clear solutions…"
Prabhat leads the NERSC Data and Analytics Services Group at Lawrence Berkeley National Laboratory. His main research interests include Big Data analytics, scientific data management, parallel I/O, HPC, and scientific visualization. He is also interested in atmospheric science and climate change. Quincey Koziol is the director of core software development and HPC at The HDF Group, where he leads the HDF5 software project. His research interests include HPC, scientific data storage, and software engineering and management.